A couple of years ago, filled with disgust at the sleazy corruption of the federal Leviathan, I put forth a simple explanation for what happens in Washington, DC. 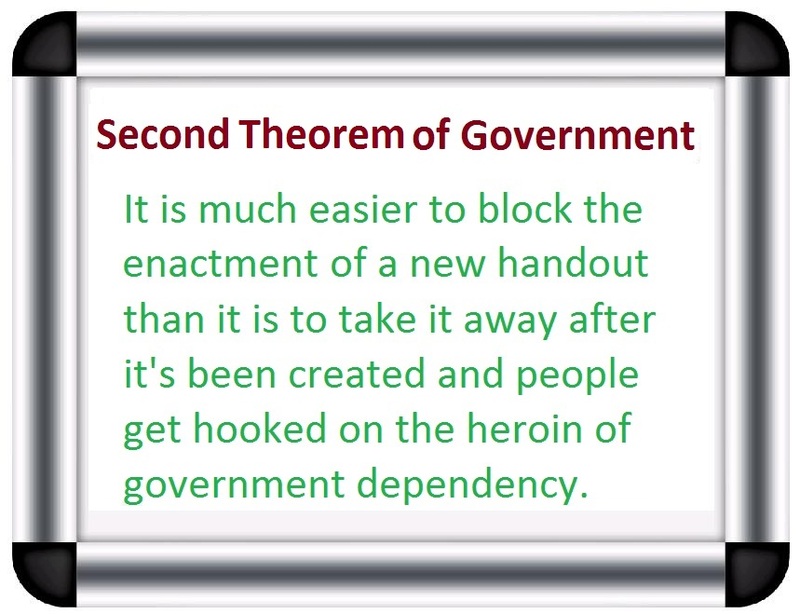 I call it the “First Theorem of Government,” and I think it accurately reflects the real purpose and operation of government. Except I probably should have added lobbyists and contractors. And it goes without saying (though I probably should have said it anyhow) that politicians are the main beneficiaries of this odious racket. I think this theorem has stood the test of time. It works just as well when Republicans are in charge as it does when Democrats are in charge. But it doesn’t describe everything. For instance, Republicans have won landslide elections in recent years by promising that they will repeal Obamacare the moment they’re in charge. Well, now they control both Congress and the White House and their muscular rhetoric has magically transformed into anemic legislation. This is very disappointing and perhaps I’ll share some of Michael Cannon’s work in future columns about the policy details, but today I want to focus on why GOP toughness has turned into mush. But that’s just a small part of the problem. The real issue is that it’s relatively easy for GOP politicians to battle against proposed handouts and it’s very difficult to battle against existing handouts. That’s because government goodies are like a drug. Recipients quickly get hooked and they will fight much harder to preserve handouts than they will to get them in the first place. Here’s a recent interview on FBN. The topic is the Republican reluctance to fully repeal Obamacare. I only got two soundbites, and they both occur in the first half of the discussion, but you can see why I was motivated to put forth the new theorem. Simply stated, I’m disappointed, but I’m more resigned than agitated because this development was so sadly predictable. And here are a couple of follow-up observations. I guess we’ll call them corollaries to the theorem. You break it, you buy it – Government intervention had screwed up the system well before Obamacare was enacted, but people now blame the 2010 law (and the Democrats who voted for it) for everything that goes wrong with healthcare. Republicans fear that all the blame will shift to them if their “Repeal and Replace” legislation is adopted. Follow the money – What’s partly driving GOP timidity is their desire not to anger many of the interest groups – such as state governments, hospitals, doctors, insurance companies, etc – who benefit from various Obamacare handouts. That’s what is motivating criticism for politicians such as Ohio’s John Kasich and Alaska’s Lisa Murkowski. Don’t throw the baby out with the bathwater – The “Cadillac Tax” is the one part of Obamacare that’s worth preserving because it will slowly cut back on the distorting tax preferences that lead to over-insurance and third-party payer. For what it’s worth, the GOP plan retains that provision, albeit postponed until 2025. The switch in time that saved…Obamacare – I’m still upset that Chief Justice John Roberts (aka, the reincarnation of the 1930s version of Justice Roberts) put politics above the Constitution by providing the decisive vote in the Supreme Court decision that upheld Obamacare. If the law had been blocked before the handouts began, we wouldn’t be in the current mess. For these reasons (as well as other corollaries to my theorem), I’m not brimming with optimism that we’ll get real Obamacare repeal this year. Or even substantive Obamacare reform. P.S. Now you know what I speculated many years ago that Obamacare would be a long-run victory for the left even though Democrats lost many elections because of it. I sometimes hate when I’m right. Invasive laws reducing individual choice and freedom in the health care sector, are extensive. But perhaps there is a way to ride emerging collective sentiments to further the liberation of individual to meet and satisfy their own health needs. That option emerges, ever softly, through the legalization of marijuana. Suppose we just legalize access to drugs – habit forming and curative – for all adults. Insofar as those prone to addiction – heroin, cocaine, etc. – the black market and criminal economy would be eliminated. The quality of drugs and dosages would be precise to users. Accidental overdosing, and accompanying deaths, would fall substantially. The availability of kits to self-administer countermeasures to the effects of the drugs would become known, and available. Funds to educate and treat addicts could be raised through user taxes similar to those now levied on tobacco. The costs of law enforcement and incarceration would would largely be eliminated. And here is the kicker….the cost of health care in general would also drop, perhaps precipitously, as self care by individuals became more practicable. Health professionals would develop approaches to the public with services responsive to their choices. Diagnostic systems, and medical records on the internet would become common, facilitating not only diagnoses, by follow up, and preventive care. Ratings on the quality and performance of health professionals, and hospital care, as well as comparative costs of services, would emerge.